Morning Song School provides a beautiful array of handmade toys. Children choose from hand dyed silks of rainbow colors, fine hand-carved and painted animals, natural wooden tree blocks, wool crowns & more. Their play is limitless. Children may decide to put on their gnome hats, divide the “magic stones” amongst themselves and go treasure hunting with their tool sacks; in the next moment we may find them building “Ireland” with their toys and cloths and the entire group is excited as they add to the towns and land in hopes of catching a leprechaun. Our intimate group allows children to connect with one another in a family-like manner. One of our specialty teachers stated, “Morning Song is the only school I have worked in where the entire group, boys and girls, all play together beautifully”. Children love circle time; it is a highlight of our morning. Most of our circles include the unfolding of a story, told through songs involving a great deal of movement. We incorporate puppetry and various games. We create our circles with the intention of using the whole body through movement and exploring the space around us, building body/space awareness. Children learn to move with cadence as they hop, skip, stomp and clap. 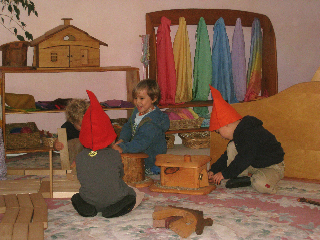 They learn the beginnings of counting, adding and subtracting in a joyful manner through games, songs, finger plays and dividing up silks and other items used during circle time or play. 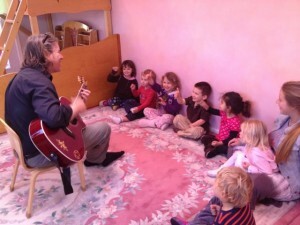 At Morning Song, the children anticipate our daily circles with great excitement. Using our bodies and imaginations, we integrate and weave together storytelling, music and language in a way that engages the whole child. Children’s Yoga helps us to learn more about being in our bodies and limbs, while exploring imaginary worlds. The children are excited at the chance to become a butterfly on a great adventure changing into opening flowers, standing as a strong tall tree and stretching like a dog or becoming other animals along the way. Our focus on full body movement helps develop children’s concentration, coordination, body awareness, flexibility and balance. 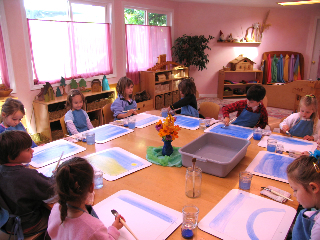 During these movements, children become more connected with their inner self as they deepen their relationship with the natural world around them. They truly feel what it might be like if they were a snake moving about without arms or legs. When children imitate the sounds and movements of nature, they have the opportunity to take on the qualities and become another being. They learn, through becoming another being, a deeper understanding that we are all connected. For example, when a child assumes the pose of the lion, they relate to the lion by experiencing the power and behavior of the animal all while experiencing their own inner power. The children experience the strength and force associated with aggression, and then withdraw to an inner state of calm. Movement has many benefits and is a great gift to give to our young children. It is a noncompetitive physical activity fostering self-esteem and body awareness while encouraging cooperation. Morning Song also incorporates Eurythmy for the children into our daily circles and movement. Eurythmy is the art of movement that makes visible the tone and feeling of music and speech in which the whole body is engaged as an instrument. 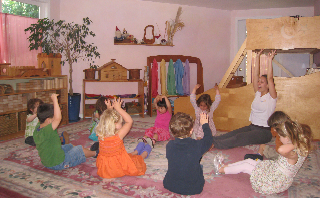 This form of movement and dance has been used for many years in Waldorf schools across the world. Eurythmy helps to develop concentration, self-discipline, and a sense of beauty. In addition to these benefits, Eurythmy has a beneficial effect on coordination, concentration and posture, helping considerably in bringing balance and harmony to the unfolding individuality. Eurythmy enlivens the creative forces and the children are supported and strengthened by it. This training of moving artistically with a group stimulates sensitivity to the other as well as individual mastery. Eurythmy lessons follow the themes of the curriculum, exploring rhyme, meter, story, and geometric forms. Curative Eurythmy is also used as a therapy. For example, particular movements of the arms and legs, practice in a definite sequence, are used to correct disturbances and weakness in childhood development. 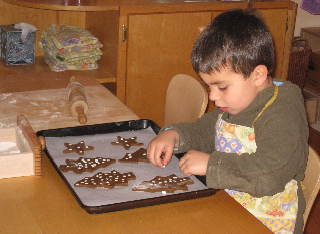 Our handwork activities involve practicing fine motor skills and developing newly discovered abilities. Handwork activities may include finger knitting, beeswax modeling, clay work, stitching (and repairing), making homemade play dough, and learning dry or wet felting. We enjoy making crafts in celebration of seasonal changes, such as the harvest and making cornhusk dolls or making autumn gnomes for the nature table. Though children take some handmade items home, this is not our goal. We may make things for one another as gifts and some are pieces of work created together with classmates and teachers to use in school (such as puppet making, making beeswax figures for our nature table or making clothing for the dolls). We love to gather together to sing playful songs with our dear friend and amazing guitar player, Paul Robinson (aka “Mr. Paul”). Paul brings the children on a ride over oceans, towns and fields with his singing and exceptional guitar playing. It is engaging and fun for all. 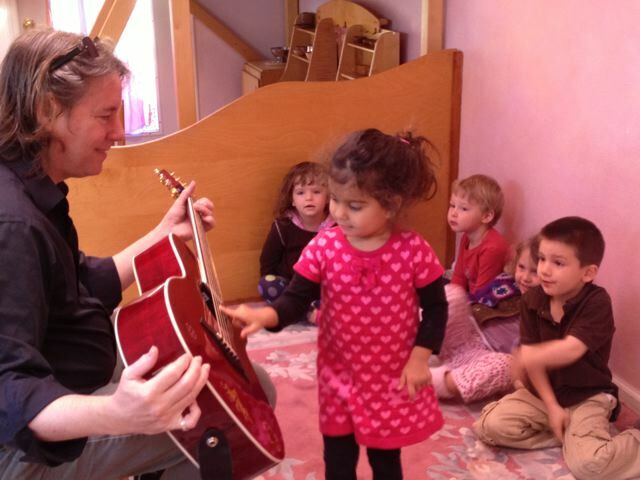 Having played guitar since he was a boy, Mr. Paul remembers the magic, joy and inspiration music brought to his own childhood and he has seen the difference it has made in his own son’s life; he loves sharing this gift with all children. Blending comfortable children’s standards (Wheels on the Bus, Old McDonald, Bingo) with fun pop songs or newer children’s songs (Yellow Submarine, Bob Marley’s Three Little Birds, Baby Beluga), he engages the children with great excitement. Paul is the lead guitarist for Dan Hicks and the Hot Licks and loves to bring joy and fun to the adults as well, and he also teachers music and guitar throughout the Bay Area and in our local high schools. 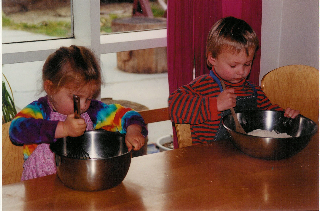 Through cooking, baking and food preparation, children begin learning Practical life skills, such as pouring, stirring, chopping and measuring (learning the beginnings of number recognition). Children find great joy and satisfaction in harvesting from our gardens. We taste herbs and plants and we prepare different types of soup or salad with the children. Through this experience, the children learn to love and appreciate new and healthy foods. 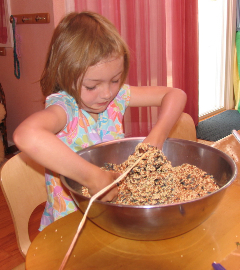 Another activity the children love is grinding the grain to make flours for our breads. On baking day, we bake fresh bread with whole organic grains. After the children knead and work their dough, it is finally ready for them to form their dough into “treasure bread”, adding cranberries, nuts or raisins before we bake it in the oven. Mmmm, the smell of fresh bread baking fills the air and we cannot wait to taste it! We also cook seasonal foods, such as cooking with pumpkins in the fall and then making pumpkin muffins or bread, or creamy pumpkin soup. 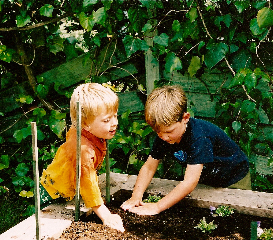 Gardening furthers the child’s ability to follow the rhythms in nature. Plants have the power to change our lives. They provide simple and therapeutic pleasure. Caring for our garden allows the child to observe the changes and cycles in plants from the beginning stages of planting through the harvesting and eating. Vegetables, fruits, flowers & trees, butterflies, birds and insects all participate in raising the child’s awareness of the processes of life. Through careful care, children begin to understand the importance of the earth’s elements & the effects of the sun, wind, rain and soil on our tender plants. We express appreciation for all who take part in farming and providing foods for our table. We make it a goal to spend a large portion of each day outdoors, regardless of the weather. All weather is good weather if we are properly dressed. Children need the fresh air and some require the ability to play loud. Outdoor play offers children new challenges for growth and development. Children climb, run, jump and balance. They push heavy carts and build structures with large, wooden building blocks. We work together in the gardens raking, digging, and moving objects. Children live by their will, their action. They learn by watching the teachers do their work and are carried along in the activity through their desire to imitate. 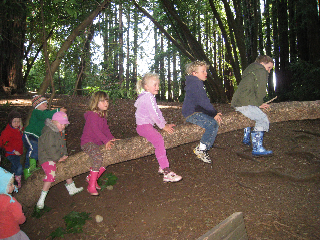 Children love playing on the wooden climbing structure, climbing the tree or swinging on the tree swings. They cross the bridge and play in our boating area where the children become captains (spying through their spyglass), sailors, pirates or fisherman over the granite riverbed. 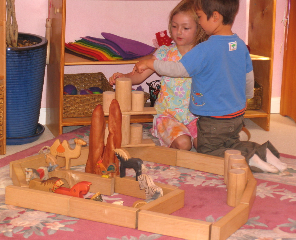 Our sandbox is large enough for all the children to play in together (and they often do). The children love the a tire swing and trapeze bar, and also love playing outdoor games together. Other fun activities may include hula hooping, jump rope, chalk, tricycles and balls. 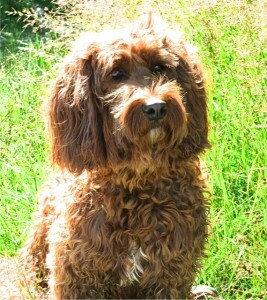 Children also have lots of fun running and playing with Shanti, our school doodle. When it is raining the children love to splash in the rain and jump in puddles. The teachers work close by in the gardens, not interfering with the child’s world of play though always remaining close enough to know what is happening and being available to help if a situation arises. 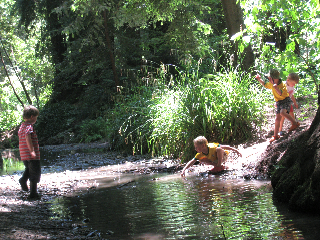 We love to spend school days in the marvelous, local redwoods (the children like to call it “Fairy Glen”) with a creek running through it, when possible. Children thrive in nature. Our goal is to do this in the springtime after the rainy season has ended (we do not have shelter to escape the cold or storms) or, if the group is ready and is settled into school and their new relationships, we may do this in the fall as well. To the young child everything is alive, especially in nature. Nature is a place where children naturally feel right at home. It is a world that delights and brings a sense of awe; children cannot get enough of it. Nature to the child is a magical kingdom; the magnificence of the movement of an earthworm, the mystery of a shadow, the wonder of ants working together to build an ant hill, the counting of spots on the ladybug, the delight of the leaves dancing in the wind and…the chance meeting of a forest fairy! 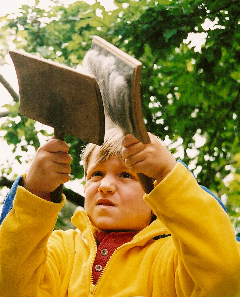 Children learn to overcome personal obstacles as they explore and play at the Fairy Glen. The landscape requires agility and perseverance to manipulate oneself down the sloping hillsides and across huge trees. They learn to climb trees, cross the creek over logs and stepping stones, and collect treasures to make little houses for the fairy folk such as stones, pine cones, acorns and more. The children explore in all seasons, experiencing the slow, methodical processes of growth and decay. 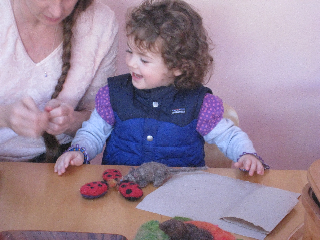 The magic and joy of the natural world is naturally apparent to young children. Children enjoy the company and guidance of adults who are delighted and fascinated by the natural world. Many children today are uncertain of what to do in nature. 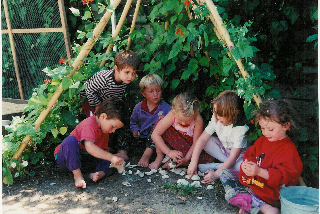 Children surrounded by a material culture need time in nature to maintain an inner balance. Nature teaches children that most good and lasting things in life involve a process, require time, and call for personal interest. These are qualities necessary in building human relationships and being able to follow through on a task. We encourage all families to explore in nature and play with their children as often as possible, and away from the man-made play areas. Caring for animals strengthens the child’s individual nurturing qualities. Our curriculum consists of stories and songs that bring up images of caring for animals and understanding their needs both in the wild and in our home. We care for critters in nature by making offerings such as seed gifts for the birds. Morning Song has a wise and gentle (outdoor) kitty named Tiago and a fluffy, playful (non-shedding) Doodle named Shanti. The children learn to use their gentle voices and hands to attract the kitty and find out quickly that this soft approach is the only thing that allows Tiago to feel safe and remain with them. They also learn to care for Shanti and have the opportunity to “wrestle” toys from her and throw her balls in a game of chase ~ as well as learn how to communicate with her in a respectful manner. At times, the children get to experience the magic of motherhood when we invite baby labradoodles into the world. The children help hand raise them and bottle feed, falling in love of course with every one of them. It is quite rewarding for all involved. 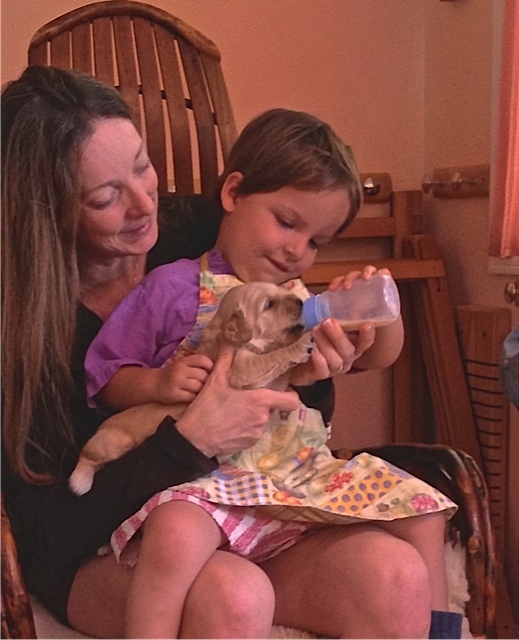 From time to time, children bring in small pets from home for a visit. We have had visits from goldfish, sea monkeys, a new puppy, a pet mouse and a spider. 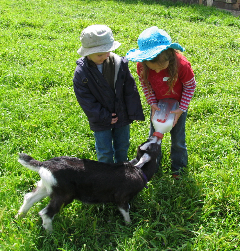 When we visit our friends at Slide Ranch, the children have further opportunity to experience animals on a working farm. We have milked mama goats and bottle-fed the babies, pet newly born lamb, and carded and spun wool sheared from the sheep. 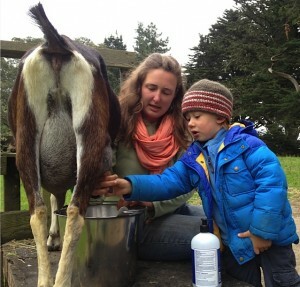 The children also feed chickens, gather eggs, visit the beehive and more.